Why Don't Hamsters Have Good Eyesight? Hamsters were never meant to live in small cages, in small suburban homes. The hamster was meant to create burrows and only venture out at night. Living underground and being nocturnal doesn't require great eyesight. Instead, a hamster interprets his world through sounds, scents and touch. Note that your pet's poor eyesight could result in injury. By understanding the extent of your hamster's vision, you can provide a safe habitat for your pet. Hamsters are burrowing animals who live underground. They spend the daytime hours sleeping and run and forge for food during the night. This means that they rely more on their senses of smell and hearing than eyesight. At birth, the hamster is completely blind and in adulthood can only see a few inches past his nose. The poor eyesight of the hamster has a lot to do with his nocturnal nature. Like most nocturnal animals, the hamster relies on other senses to navigate his way through life. The hamster does have a wide angle of vision and sees better in dim light. In bright light, the hamster is almost completely blind. Hamsters also rely on their whiskers to explore the world around them. Understanding your hamster's poor eyesight is essential for keeping him safe. Never house your hamster in a multi-level cage, as he has no idea how far up he is. This can result in broken limbs, internal organ damage or even death should your hamster fall. Never allow you hamster to perch on your shoulder or hold him while standing either. The hamster may leap from his position and hurt himself. If a hamster escapes, he may also get into danger because of his poor eyesight, such as stumbling across a mouse trap hidden under the refrigerator. Hamsters are known for their biting behavior, but their poor eyesight is usually to blame. Because of their poor eyesight, sudden movements can frighten them, resulting in a bite. The hamster may also bite because he can't see who or what you are. The behavior is purely defensive and shouldn't be taken personally. When handling a hamster, always be gentle and make slow movements. 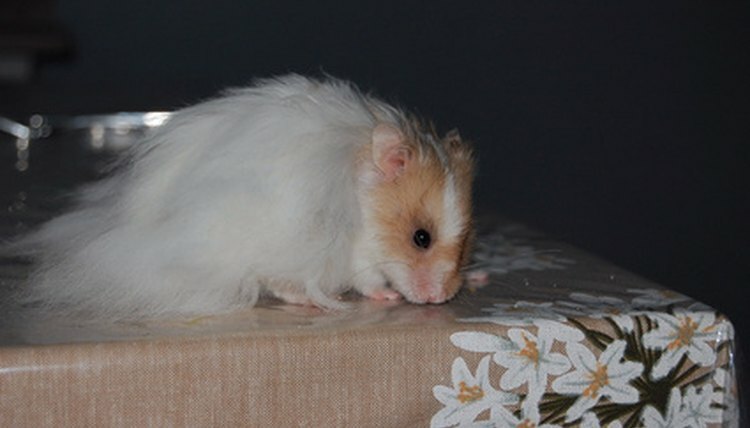 It will take a couple weeks of scent introduction and regular handling until your hamster is hand-trained and less apt to bite. Where Do Hamsters Like to Be Petted? How Hard Are Hamsters to Take Care Of? What Does a Hamster Screaming Mean? What Is the Difference Between Hamsters & Mice? Can Hamsters Be Kept Outdoors? How Do I Get My Hamster to Come Back to His Cage?